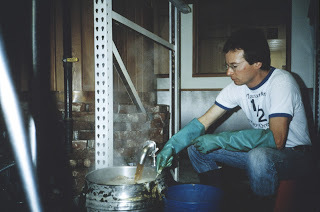 Yesterday's big news on the impending retirement of Kurt Widmer from the Craft Brew Alliance hit like a ton of bricks. The story popped up on the news wire in the late afternoon and mostly took the form of a regurgitated press release with little or no analysis. It's the "new" journalism, you know. Kurt Widmer will step away from his role as chairman of the CBA board at the end of the year. He expects to spend more time with his wife and family and hopes to write new chapters while there's time. He's a young 63, so there is certainly time for a novel or two. For a while now, I've been wondering when something like this might happen. Believe me, I have no inside sources at Widmer or the CBA. I'm not even on their media list, so I didn't receive the press release. But I've been thinking this might be a good time for one or both of the brothers to move on. More on why in a minute. This is a big deal. If you're making a list of the most important folks in Oregon brewing history, Kurt Widmer is on it. He's right there with names like Saxer, Weinhard, Coury, Larrance, Ponzi, McMenamin, Bowman, Eckhardt, Younger, Fish, Joyce and, of course, Rob Widmer. When the Widmers launched their little enterprise back in 1984, their expectations were modest. Like most of the early craft brewers, they didn't expect to make a lot of money. They were doing something they enjoyed and hoped to make a living at it. It sounds quaint and naive looking back, after they've made millions, but that's how it was in the beginning. Kurt Widmer was the idea man. He's the one who had experience with European beers, having lived there. He's the one who saw the rising popularity of imports and thought that market could be tapped with beers made here. He's the one who got Rob on board, which took about a nanosecond. And he was at the helm navigating the significant challenges during the formative years. Things are much different today. The partnership with Anheuser-Busch, announced in 1997, and the formation of the CBA in 2008, have pushed Widmer and affiliated brands Redhook and Kona into markets around the country. This ceased to be a small, self-contained business many years ago, but the transition to a highly structured corporate organization occurred in just the last few years. When you look at what they've built and what Widmer and the CBA are today, you really have to wonder what Kurt and Rob have left to accomplish. Nothing, I think. That may be particularly true of Kurt, the thinker and idea man who directed traffic for so many years and now finds himself watching as others call most of the shots. The press release says Kurt will stay on until the end of the year and help identify a successor as chairman of the board. Rob Widmer, who has never held a spot on the eight-person board, has no plans to leave the organization and the brothers will retain their ownership stake in the company. Together, they own nearly 12 percent of CBA common stock. Given the current pace of buyouts and mergers in the beer world, I can't help but wonder if the CBA will be fully absorbed by Anheuser-Busch in the near future. Could Kurt Widmer's departure be a precursor? AB owns roughly a third of the CBA and holds two seats on the board. How many of the remaining board members favor a sale? I don't know, may not want to know. It seems to me the CBA brands, particularly Kona and Widmer, fit perfectly with AB's strategy. If it acquires the CBA, AB can mass produce those beers in factory breweries and flood the market, undercutting independent craft brewers around the country. If that's what's coming down the pike, I'd say this was exactly the right time for Kurt Widmer to get out. As with so many things, time will tell.